When many folks think of eating healthy, they often think they have to give up some of their favorite foods such as pasta which is just not so. There are many varieties of healthy pasta in the market these days that add nutritional value to your daily menu. I prefer Barilla Wholewheat, or Barilla Plus pasta brands which cook up beautifully and no one would ever know they were eating “healthy” pasta unless you told them. To ensure your pasta dish is as healthy as it can be, think about using fresh vegetables in your sauces, and stay away from heavy meat or dairy based sauces. Another tip to keep the calorie count down is to keep your pasta portion small, and fill up the dish instead with extra vegetables. By doing this you can still enjoy pasta in your weekly menu, feel satisfied, and you will not even miss the larger portion size. In this recipe which we make often during the summer, the mix of the cold salad with the hot spaghetti creates a great taste. This sauce benefits from sitting for a few hours to allow the flavors to meld, so you can even make it before you leave for work in the morning. Leftovers are fought over in my house, and are enjoyed either at room temperature as a salad, or warmed. This sauce can also be used as a dressing for pasta salad, as a topping for grilled fish or chicken, or even as a bruschetta topping. The only absolute requirement for this dish is to use very ripe, flavorful tomatoes. Otherwise, you can increase the amount of onions or garlic if desired, add extra hot chile, or try out different fresh herbs for a change. 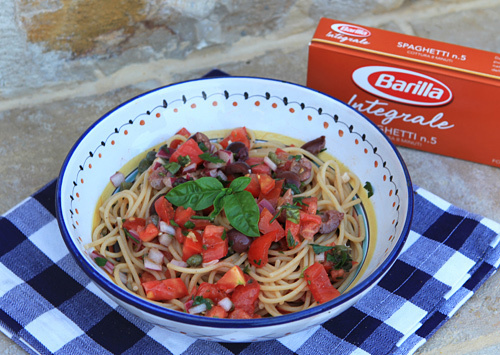 Whole grain pasta is chosen instead of the traditional type which adds nutritional value including protein and fiber. 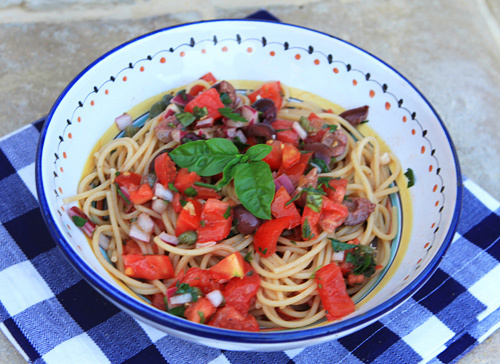 A wonderful summertime pasta, easily assembled if you prepare the sauce ahead of time. 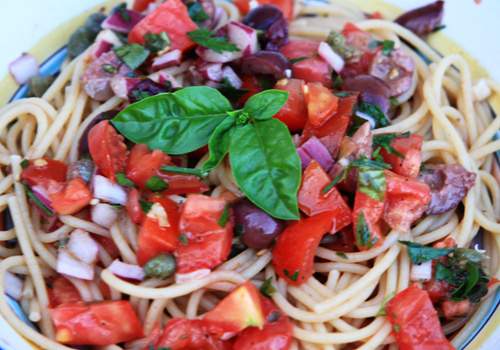 Combine tomatoes, onion, olives, garlic, parsley, basil, capers, hot pepper, and oregano. Mix well and let sit 4 to 6 hours to allow flavors to meld. Drain pasta well, and then mix immediately with the sauce. Serve at once, offering grated cheese at the table if desired.